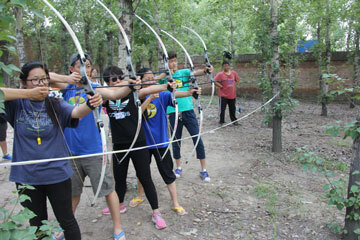 Evergreen’s Joy in the Journey Camp (JJ Camp) is an adventure-based English camp in Yangqu County established in 2009 that provides a safe environment for youth to grow as whole people, make lifetime friendships, and improve their spoken English in a natural and hands-on way. With just over an acre of land, we maximize our creative abilities (and people resources!) and provide kids with a life-changing experience of English exploration, adventure activities, zany games, and leadership development year after year. 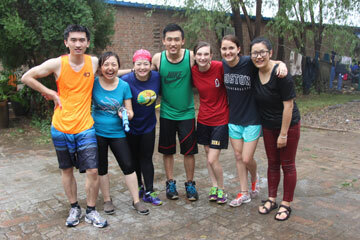 The majority of our campers on any given week have attended previous years, and our greatest joy is to see their growth from visit to visit, as well as the growth in the lives of each college-aged Chinese volunteer who joins the JJ Camp family. Also, the time spent together at camp carries over into the school year when, twice monthly, we invite campers, college-aged volunteers, and their friends to join us for English activities in Yangqu and Taiyuan. At Joy in the Journey Camp, we strive to positively impact the lives of kids and teens. If that’s your passion too, consider joining us! For 6 weeks in the summer (July-August) and 2 weeks in the winter surrounding Chinese New Year (January or February), we are in need of English-speaking volunteers to help with English activities, interacting with campers and giving them lots of oral English practice, leading music and/or group activities, and assisting with maintenance and renovations. For inquiries about joining us for camp, click here to contact us.